In the Minster's St Ursula's Chapel was the tomb of the counts of Moosburg. 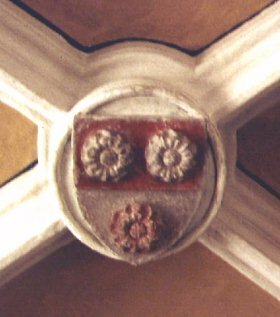 Therefore, the boss of the chapel's vaulting bears their family arms: silver and red roses on a red and silver shield (the colours seem to be mixed up, though). After the last count had died in 1281, the town of Moosburg was allowed to use the roses as the town arms - possibly because Moosburg citizens supported Duke Ludwig (Louis) of Bavaria in the battle of Gammelsdorf in 1313. The present coat of arms of Moosburg has two red (gules) roses on a silver (argent) background and a silver rose on a red background, together with a turreted coronet and an old-fashioned mantling. Sometimes it is argued that the roses should have five petals instead of six, according to the historical examples. Last update 30 Nov 1999 by © Werner Schwarz (E-Mail) - All rights reserved!